You can use Ten Commandments craft activities for kids at Sunday School, Vacation Bible School, play dates and family craft nights. 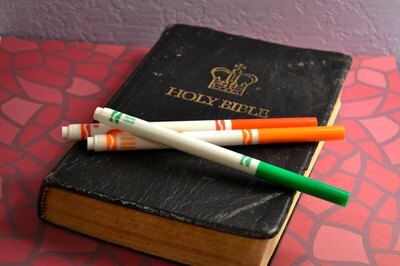 Crafts are a great way to help children learn Bible lessons while having fun. Keep crafting sessions short enough to hold a child’s attention span, and always supervise children using scissors, glue or markers. Each child will need two empty cereal boxes of the same size. You will also need butcher paper or craft paper, tape and markers. Have the children wrap the cereal boxes in the paper, like wrapping a gift. Younger children will need assistance. Use tape to secure the edges. 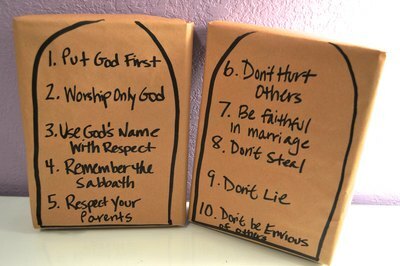 Have children write the Ten Commandments on the boxes. Let them use their own words to paraphrase each commandment. This activity is best for children ages 6 to 10, and takes about 15 minutes. This is a two-part activity that should follow a lesson about Moses receiving the Ten Commandments. For the first part, you will need plain white paper and markers or crayons. 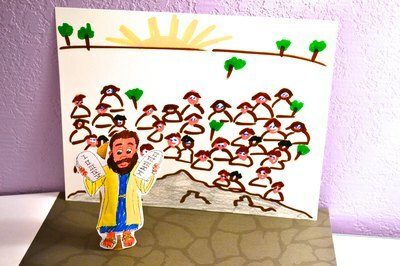 Have children draw a backdrop of Mount Sinai and the crowd of Israelites waiting for Moses. For the next part of the activity, children will create a paper tube Moses figure to place in front of the backdrop. You will need empty toilet paper tubes, construction paper, safety scissors, glue and markers. Supervise children closely while using scissors and glue. Have children cut out rectangles of construction paper to wrap around the tubes for Moses' robe. Cut out a circle for his face and a shape for his beard. Cut two narrow strips for his arms and rectangles for the stone tablets. You may find it helpful to use templates for younger children. Glue the robe around the tube for the body. Use the markers to add features to the face, then glue the face to the body. Add the beard. Glue a tablet to each arm, and glue the arms to the body. Now Moses can stand in front of the Mount Sinai backdrop. This activity is best for children ages 5 to 8 and takes about 20 minutes. This craft results in a bookmark that kids can keep or give as a gift. You will need card stock, scissors, a hole puncher, ribbon, and markers or pens. Have the children cut the card stock into 4-by-10-inch strips. 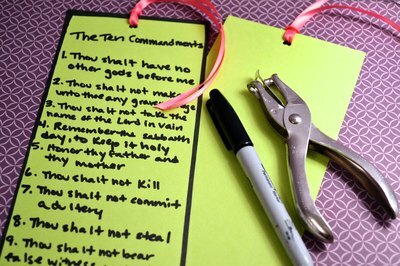 They can then use markers or pens to write the Ten Commandments on the strips, using the fronts and backs. Punch a hole at the top center of each bookmark, thread a ribbon through and tie a knot at the end. This activity is best for children ages 6 to 10 and takes about 10 minutes. Enchanted Learning: Toilet Paper Roll Crafts. Teacher Help: Crafts for Kids.